The Flechtner Shooting: Self Defense or Murder? This report analyzes and reconstructs the shooting of three persons in the driveway at 4554 Begonia Road, Phelan California on October 4, 2009 at approximately 1945 hrs. Phelan is a high desert community with no paved roads near the city of Victorville, California. Dennis Flechtner, was the shooter and the deceased were Adam Owen, Robert Light and Angela Leird. There was a single witness to the shooting, Whitney Telliano. The shooting was the culmination of a twelve-year dispute between neighbors Flechtner and Leird. Flechtner was charged with three counts of first degree murder. The reconstruction assisted the jury in coming to a decision of "not guilty" for all three counts. Officers Dennis Doty and Phillip Trust entered a residence in Riverside, California to arrest Jackson Daniels, a wheel chair-confined felon. Upon entering the house, both Doty and Trust were involved in an exchange of gunfire with Daniels. Fifteen shots were fired with three .38 revolvers. Officer Doty lost his life within seconds of the start of the shooting. But the wounded Officer Trust interacted with his assailant and the crime scene for a number of minutes after the death of Officer Doty. The interaction between Daniels and Trust during these minutes created a complex crime scene which due to an error in the prosecution’s reconstruction (selection the wrong wound as the first suffered by Trust) left the interpretation of the scene confused. Selection of the correct first wound for Trust and an understanding of the consequence of that wound allow for the presentation of a scenario that connects most features of the entire crime scene. The results of this analysis make it clear that Jackson Daniels was relentless in his quest to kill Trust and he took a thoughtful and patient approach to achieve that goal. This study shows that the victim was shot in the head with the pistol’s muzzle at intermediate range. Due to probable post shooting handling, the gunshot residue (GSR) was lost from the surface of the hair that was collected from around the victim’s head wound. It is shown in this study that the pistol discharge was close enough to cause cuticular hair scales to be lifted, but not removed, in the muzzle blast and GSR inserted under the scales. The GSR under the cuticular scales was thus protected from mechanical and chemical removal. The number and form of the GSR particles observed from the victim’s hair sample when compared to the observations from test shot hair indicate that the firearm ‘s muzzle could have been as close as 6 inches but not further than 12 inches. vehicle and documenting the GSR burden on interior surfaces of a similar car resulting from such a discharge. The victim sustained a fatal bullet to the head from a Ruger .44 Magnum Carbine (18.5-inch barrel length) in 1973. The shooter was the victim’s husband who claimed the rifle accidentally discharged while he was cleaning the newly-purchased rifle. At the time, the shooting was determined to be accidental. No physical evidence remains of this shooting with only the autopsy report and a small number of shooting scene photographs. In 2006, that same shooter was accused of the shooting death of his most recent wife. The 1973 shooting was re-filed as murder. The characteristics of the Ruger .44 Magnum Carbine are examined in this study as to partially-burned powder discharge from the muzzle as well as sooting of close targets. The shooting of teenager Christopher St. Louis by off-duty police officer Tanaya Webb at the Santee, California Petco shopping center the evening of February 16, 2003 is examined. Four shots were fired in one second with a Glock Model 27, .40 caliber pistol and St. Louis received four wounds: left chest, right chest, lower right abdomen and right arm. He died minutes after being shot. St. Louis was shot while running towards Webb. The shooting scene reconstruction indicates that St. Louis received the first shot approximately 27 feet and the last shot when he was approximately 15 feet from Webb. The investigation of the circumstances of the death of Colonel James E. Sabow is continued in this report. The extraordinary quality of the photographs of the crime scene and autopsy was instrumental for this examination. Evaluation of the gunshot residue, back spatter residue, cranial injuries, blood spatter, the Colonel s bathrobe and the position of the body lead to the conclusion that Colonel James Sabow was murdered and an attempt was made to stage the body to appear that he committed suicide. The Colonel was rendered unconscious and mortally wounded by a devastating blow by a broad, flat club to the right occipital region of his skull prior to the intraoral shotgun blast. The reconstruction of the homicide crime scene indicates that three or more assailants were likely. The victim died from a single.22 bullet wound to the chest that came through a window and the victim's girlfriend was accused of the homicide. This case has been published (B.R.Burnett, Journal of Forensic Sciencses. 2001. 46(2):379-385). The purpose of this article is to reexamine the extraordinary nature of the physical evidence of this case and discuss the testimony of three experts who testified in one or more of the three trials of People v. Delia Contreras. Concentrations of lead in keys, both old and new are reported. A health risk exists for the entire population, not only for locksmiths/key makers. Small children may have significant lead exposure, especially for those children that put keys in their mouths. Gunshot residue samplers from suspects in shooting cases should not be reported as having particles "consistent with gunshot residue" when the only particles found are lead. A significant environmental source of lead particles in gunshot residue samplers is likely from house and automotive keys. The gunshot residue evidence in the case of People v. Robert Blake is presented. Automated scanning electron microscopes (SEM) equipped with elemental analyzers (energy dispersive X-ray spectroscopy, EDS) were used to find and identify presumptive gunshot residue particles from the evidence. Errors were made in the handling of Mr. Blake after the shooting, testing the murder weapon, testing Mr. Blake's revolver, storage of Mr. Blake's clothing, interpretation of spectra from almost all of the analyses and the assignment of particles as "consistent" or "highly specific" to gunshot residue. In addition, the gunshot residue reports fail to distinguish between individual and populations of particles, a critical distinction considering virtually all elemental combinations of lead, antimony and barium found in gunshot residue may also originate from environmental sources. A limited evaluation of the testimony by the defense expert is presented. Mr. Steven Dowell of the Los Angeles County Department of the Coroner provided a summary on this case at the Scanning 2005 meeting (April 7, 2005, Monterey, California). A transcript of Mr. Dowell's talk is attached to this article. 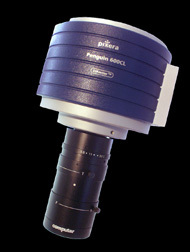 The Pixera 600CL, a 5.8 megapixel peltier cooled CCD camera, when attached to a macro zoom lens can be stopped down > f 44. This allows for extraordinary depth of field of objects up to ~ 15X that match or exceed that of the scanning electron microscope. This is the analysis of a shooting where the assailant shot the victim twice with a .22 revolver. The ammunition was Remington with a single metal primer. The weapon attributed to the shooting is shown to have likely last fired Federal three-metal primered ammunition and thus could not have been the weapon used in the shooting. This paper examines the effect of previous-shot gunshot residue (GSR) contamination as well as the GSR compositional differences in samples from the breech, target and bore. This work also shows that the accumulation of GSR within a .22 revolver, especially from different ammunitions, makes the resultant GSR composition from a shot unpredictable. The antimony that covers most modern .22 bullets is likely to contribute substantial amounts of antimony to the GSR of some shots. Six security motion devise covers were received for analysis following apparent failure of the security system in a tire/brake store burglary. Four of the covers of these thin plastic sheets were from failed devices and two were controls. The control covers were from devices that operated normally. The covers were examined by normal light, ultraviolet light transmittance and scanning electron microscopy/elemental analysis. The submitting party suspected that some sort of material was sprayed on these covers, rendering them inoperative. The results of these analyses indicated no evidence of human manipulation. Rather, it is apparent that environmental factors likely caused the degradation of the plastic covers which resulted in the failure to allow the radiation specific to the motion detector to pass through. A series of experiments were performed to determine how skin debris (desquamated epithelial cells and skin oils) affects gunshot residue (GSR) particle detection on SEM stubs: 1) A dabbing experiment showed that GSR particles accumulate not only on the adhesive surface of the sampler, but also on the epithelial cells. 2) A bleach solution made up of sodium and calcium hypochlorite was used to remove skin debris from gunshot residue samplers. This bleach treatment revealed particles that were originally hidden by skin debris. Skin debris not only accumulates GSR particles, but also obscures particles. A sampler was initially loaded with target gunshot residue (GSR) and then was dabbed 30 times on the back of a hand. A number of high-resolution (4096 x 4096 pixel) backscatter images were taken at 20 kV and then at 30 kV of the same areas. Following these images, the sampler was treated to remove skin debris with a sodium/calcium hypochlorite solution and additional high-resolution images were taken at 20 kV of the same areas. Comparison of these images shows that more GSR particles are revealed at 30 kV than at 20 kV. The removal of skin debris evinced even more GSR particles that were not detected on the untreated samplers, regardless of the acceleration voltage used. Errors in gunshot residue assessment by scanning electron microscopy/elemental analysis in criminal cases: I. Arsenic/sulfur mistaken for lead. Automated scanning electron microscope analyses of gunshot residue samplers are being performed by many crime laboratories all over the world. Often the criminalist-technician operators of these instruments do not have adequate training for the interpretation of spectra generated by energy dispersive X-ray spectroscopy. Case 1 is an example of this. Case 2 is an example of a criminalist who appeared to have misrepresented the elemental composition of a particle in order to make it "unique" to gunshot residue. This article is the first in a series of four articles that will focus on erroneous elemental assignments and/or missed elements made by ill-trained criminalists. The mistaken assignments of particle spectra to "consistent," "highly specific" or "unique" gunshot residue will also be examined in this article series. Errors in gunshot residue assessment by scanning electron microscopy/elemental analysis in criminal cases: II. Missed tin (Sn) and antimony (Sb) in an unusual, non-gunshot residue population of particles containing phosphorus (P). Automated scanning electron microscope analyses of gunshot residue samplers are being performed by many crime laboratories all over the world. Often the criminalist-technician operators of these instruments do not have adequate training for the interpretation of spectra generated by energy dispersive X-ray spectroscopy. In this case, a number of unusual particles, most of which contain phosphorus (P) and tin (Sn) were assigned by the criminalist as being "unique" to gunshot residue. Unfortunately, none of the particle spectra recorded in this case can even be assigned as "consistent," much less "unique" to gunshot residue. Errors made by this technician are 1) missed elements, tin (Sn) and antimony (Sb), and 2) including phosphorus (P) as a gunshot residue element. The origin of these particles is unknown.